The final plans for an £11.4m improvement scheme at Port Talbot Parkway rail station are being unveiled. Network Rail is holding a public information drop-in event for station users and local businesses. They are being encouraged to come and view the plans and meet the teams who will redevelop the station. Work at the station has recently started and will continue until spring 2015. Port Talbot Parkway will remain open during construction. Representatives from Network Rail were attending, alongside members of Kier Plc, Arriva Trains Wales and Tata Steel. 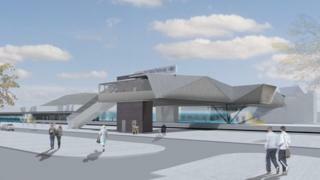 The project will involve the demolition of the existing station to make way for the new development. A new enclosed footbridge will be a key feature complete with steps and lift access to the platforms. This will house the new ticket office, waiting areas, customer facilities, information points and CCTV equipment. There will also be a 111-space car park with a park-and-ride for commuters and facilities for cyclists, bus passengers and taxis. Mark Langman, Network Rail's Wales route managing director, said: "The aim of the scheme is to completely revamp the station environment at Port Talbot by making noticeable and lasting improvements for the benefit of passengers. "In the longer term, revitalising the station and improving the gateway to the town will also act as a catalyst for further regeneration in the area." More than 180 tonnes of steel for the project will be provided by Tata Steel which has a steelworks in the Port Talbot area. Transport Minister Edwina Hart announced in December 2013 that Port Talbot Parkway was one of five stations to be regenerated as part of the Wales Station Improvement Scheme. The £24m European-backed programme will also improve customer facilities, access, capacity and park and ride spaces at Aberystwyth, Pontypridd, Rhyl and Ystrad Mynach. The public exhibition will be held on Monday at The Grand Hotel, Port Talbot between 15:00 GMT and 21:00 GMT.